I am a little late to the discussion on Greg Smith’s very public resignation from Goldman Sachs (GS) via the New York Times Op-Ed last week. I can say that while this American tai tai is quite removed from current pulse of Wall Street, I followed the story as it unfolded late last week and bled into this week, so please excuse me as I climb up on my “American tai tai soapbox” with some comments. Plenty of lively debate followed Mr. Smith’s resignation both about the way in which he resigned and over the “toxic and destructive” attitudes that Mr. Smith’s former colleagues at GS allegedly displayed towards the firm’s clients. Some of us were appalled at the degree to which Goldman traders and salespeople disparaged their so-called “clients” behind closed doors (and potentially in internal emails) but then again, we really shouldn’t be surprised by what people working at investment banks say, ether verbally or in emails these days. This is because we live in the post-credit-bust I-banking wasteland of 2012 and we are wary of Wall Street and everything it represents. Not only are Mr. Smith’s honest and revealing comments as a mid-level “GS lifer” disturbing, but they bring to the fore much of the anger, suspicion, and disgust that many Americans have towards Wall Street and encapsulates the Occupy Wall Street Movement. However amidst the debate and discussion, I think it is important to be reminded that much of Mr. Smith’s criticisms have been focused on the sales and trading side of the I-banking business and not necessarily on the advisory side of the business. Trade counterparts are not necessarily clients, and it is important to clearly distinguish between the two, particularly in referring to GS, as well as to all the other large investment banks. In the same vein, we have a hard time distinguishing I-bankers from traders and salespeople. Everyone who works at an investment bank is mostly lumped into the stew as an “I-banker” but more appropriate categories and divisions exist. People can usually tell if someone sits on the advisory or the sales and trading side of the bank. The difference between the two sides is obvious in culture, demeanor, and modus operandi. Advisory employees must be client-focused and are paid based on advisory fees, usually a result of specific transaction (equity, debt, merger, acquisition, sale, etc.) These transactions can often take months to complete. However, traders are paid to trade securities on exchanges or to make markets in over-the-counter financial products. Traders don’t necessarily have clients. They have trading counterparts who take up the other side of the trade. Counterparties are the clients of the salespeople who sit next to the traders on the trading floor, and so salespeople and traders must work closely together to get trades done. Trades are done in a matter of seconds and minutes. In reply to Mr. Smith’s Op-Ed piece, GS put out a public response later the same day. I was curious to see what CEO Lloyd Blankfein, President Gary Cohn and the GS press machine would say. But after reading GS’s official (and somewhat tepid) public comment, I was left wanting more. It is sad and slightly depressing because there isn’t any acknowledgment of a deeper problem: the problem of underlying values (or lack thereof) and of how leadership transmits values down the management chain. This is precisely what Mr. Smith was referring to when he wrote about how GS’ current leadership has “lost hold of the firm’s culture on their watch.” I agree and I wouldn’t be surprised if there were rumblings within the board of directors regarding changes in the near future. Both Mr. Blankfein and Mr. Cohn have been at their current positions as CEO and President since 2006, and have had the unenviable task of guiding GS through the credit crisis as well as dealing with one recent scandal after another. I share some of the same feelings as Mr. Smith because almost 12 years ago, I was also a bright-eyed fresh graduate joining Goldman Sachs’ Analyst Class of 2000. I was a year ahead of Mr. Smith’s class—a part of the “bubble class” that was hired just before the dot-com bubble of 2000 burst that fall. We were told that summer at training that the GS analyst class of 2000 was the largest class that GS had ever hired. Months later, many of us would be let go in the aftermath of the tech bust. But those of us who managed to keep our jobs at GS grew and thrived in a unique and amazing environment that taught us how to be model team players and citizens. I vividly remember a deep sense of pride that flowed pervasively throughout the firm and which is so well described in Lisa Endlich’s Goldman Sachs: The Culture of Success, first published the year before I joined. Culture is important, and there certainly is something to be said about how an organization can lose touch with it. Bad things happen as a result. While I was only at GS for 2 years, I still think back to the beginning of my career. 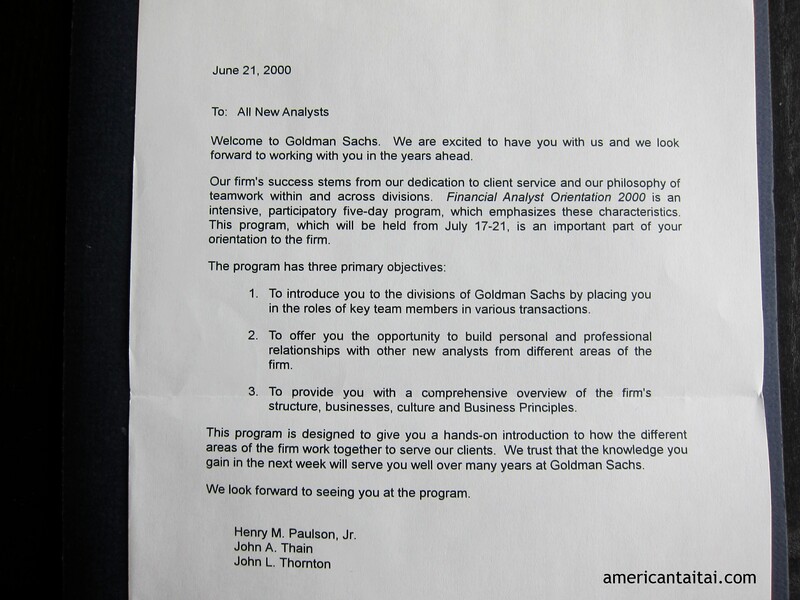 Those impressionable years spent as an analyst at GS helped to shape my philosophy of management, leadership, and teamwork. I recall working with and for many bright and capable people at GS—people who were also incredibly humble, honest, and hardworking. These were good people with integrity and who cared about their families and jobs, but also about their fellow human beings and their communities. People who were probably a lot like Mr. Smith. After my tenure at GS, I moved on to work at 2 other investment banks but nowhere was the cult and culture more palpable than at Goldman Sachs. Today, some of my best friends are the people I worked with at GS almost 12 years ago, and I find this to be quite remarkable. Now I’m not saying that everyone at GS is a good person. After all, one joins an investment bank with the aim of making a fairly decent living while doing interesting work alongside driven and intelligent colleagues. It is an attractive offer. It is certainly less attractive these days, but let’s all be up-front and get that out of the way. But in my own experience, most everyone I interacted with at GS was a decent person. I’m saddened but I do sympathize with the bad rep given to banks, particularly as careers in finance among new graduates have lost their appeal in comparison to technology start-ups and non-profit work. But I also have nothing against fresh graduates who chose initial careers in finance in order to be fiscally responsible and to pay-off hefty student-loans. I’d encourage them. In fact, that’s exactly the reason why I decided to join GS. Don’t judge. We need good people in all sorts of careers, especially in finance and banking today. Looking back, if I had the choice to make again, I’d still choose GS with no regrets. However, I must agree with many of Mr. Smith’s comments and observations about the seismic cultural shift that seems to have taken place within GS and in the industry over the last 10-years. Times have changed and the trader mentality has grown in prominence relative to traditional investment banking advisory services. All of the largest investment banks are no longer private partnerships, but huge multi-billion dollar public companies that answer to shareholders. Shareholders and investors demand (and rightfully so) a return on investment. We have seen the trend where investment banks have grown the proportion of their revenues attributed to proprietary trading activities. So it makes sense that increasingly, the investment bank’s focus on traditional advisory activities and its role as a market-maker has diminished or morphed into something else in order to boost outsized returns. No risk, no reward. Phrases like “muppets,” “ripping eyeballs out,” and “getting paid” are pervasive on the trading floor and not just at Goldman Sachs. Before I was an American tai tai, I was a sell-side fixed-income research desk analyst where I also sat in on sales meetings where traders and salespeople asked us to put out research notes that more effectively pushed the desk’s axes. But I have to say that this sort of lingo is used both ways where our traders were also trying to avoid getting their own “faces ripped off.” The sales and trading business is often a zero-sum business and I while I think Mr. Smith brings up legitimate concerns, the landscape in investment banking over the last 10 years has also dramatically changed as the trader mentality has taken over, surpassing the advisory component both in practice and in management. When I was first hired at GS 12 years ago, I attended the New Analyst Training in New York. The first week was spent talking about the firm’s culture and the firm’s business principles. Number 1 on the list of Goldman’s 14 Business Principles: “Our clients’ interests always come first. Our experience shows that if we serve our clients well, our own success will follow.” Does this principle still ring true at GS today? According to Mr. Smith and from where he sat, it did not, at least not anymore. And because of that, GS’ reputation has suffered. As I flip through the pages of my old analyst class facebook (of the pre-2004 vintage not the social network) I wonder where these people are now. What are they doing and are they making an impact in their circles of influence? Are they doing good in the world and speaking up for right when they see wrong? I’m certain some of my former colleagues in the GS Analyst Class of 2000 have become Managing Directors at GS or at other investment banks where they hold positions of power and authority. I hope these same people who now find themselves in leadership and management positions have not forgotten the GS business principles drilled into us during training 12 years ago. I’d encourage these leaders to lead by example and to strive to mentor younger analysts in being honest, working hard, and having integrity. And if these managers can’t themselves continue in good conscience, they should speak up. Mr. Smith’s Analyst Class of 2001 was a much smaller class relative to mine and according to friends who were at that less lavish analyst training session, the participants never received physical copies of their class facebook. But Mr. Smith’s photo would have certainly been there. But I don’t think he or any of his classmates would have ever thought that his biggest impact at Goldman Sachs would be his departure instead of his 12 years of faithful service. His actions should sound a rallying cry for change and dialogue at the management level. Mr. Smith did a brave thing by speaking up and I wish him the best of luck. Nostalgia, and the best friends (hope we belong there?)! Can’t believe you kept all the paperwork :D! LOVE it! How awesome that you still have our Goldman Analyst Facebook! I totally forgot we had one. 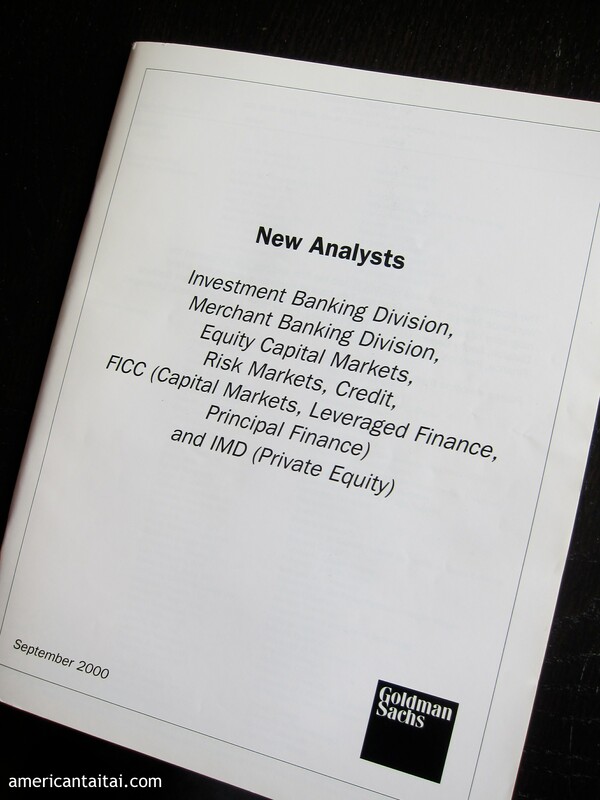 But perched on a shelf just two feet away from me is our GS Valuation Principles Guide – July 2000. Yes, and I still have the big group photo and everything too… scary!!! I was trying to clean out some boxes and found everything including all the binders from our summer training in NY! Oh and of course, the GS Valuation Principles Guide July 2000!!! 🙂 Miss you guys! Come and visit!